Grinding wheels improperly used are DANGEROUS. Be Safe Protect Yourself - Always use a guard. Wear Eye Protection. Since the more common causes of wheel breakage have been traced to improper mounting, excessive speeds, abusive operation and / or careless handling of the grinder, proper and regular maintenance service and inspection procedures obviously are of importance in preventing wheel breakage. Regular inspection and maintenance procedures must be the responsibility of the user. 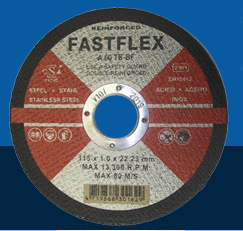 All portable type grinders should be inspected at regular intervals to insure that the mounting flanges are in good condition, of the proper size and shape, that the speed governing device is functioning properly, and that no damage has occurred to the grinder or wheel as a result of abusive use or careless handling. Always handle and store wheels in a careful manner. Always check maximum operating speed established for wheel against machine speed. Always use mounting blotters supplied with wheels. Always use a safety guard covering at least one-half of the grinding wheel. Always allow newly mounted wheels to run at operating speed with guard in place, for at least one minute before grinding. Always wear protective goggles or other protection. Always turn off coolant before stopping wheel to avoid creating an out-of-balance condition. Don`t use a wheel that has been dropped. The impact may result in breakage.force a wheel onto the machine or alter the size of the arbor hold. Don`t use a wheel that fits the arbor too loosely, if the wheel doesn"e;t fit the machine, get one that does. exceed maximum operating speed established for the wheel. Don`t use mounting unless they are 1/3 the diameter of the wheel and are clean, flat and free of burrs. Don`t over tighten the mounting nut excessively. Don`t grind on the side of the wheel unless the wheel is specifically designed for that purpose. Don`t start the machine until the wheel guard is in place. Don`t jam work into the wheel. Don`t stand directly in front of a grinding wheel when grinder is started. Don`t grind material for which the wheel is not designed. Do store wheels in a dry place at constant temperature. Do provide proper racks, bins or drawers for storing various types of wheels. Do store straight and tapered wheel on edge in racks with two point cradle support, and partitions separating wheels. Do use flat shelf for storing thin wheels on flat shelf face-to-face and base-to-base. Do use bins, boxes or drawers to store internal wheels, cups and other small wheels. Don`t store wheels in a damp place, or in extreme hot or cold temperatures. Don`t store wheels directly on edge with only one point touching shelf. Don`t store wheels on edge without guard to prevent rolling. Don`t handle wheels carelessly, grinding wheels are brittle and break easily. Don`t bump or drop wheels on one another or other objects. Don`t roll abrasive wheels across a surface. Don`t pile heavy objects on top of wheels, treat them as you would other fine tools. or the adhesion between the spindle and the wheel is not in a good condition. When the chuck of the grinder machine is abrased, it must be repaired or replaced by a new one, otherwise, the spindle will easily form the nick which is very dangerous. Mount the wheel correctly into the chuck and the revolution must be smooth and easy. To avoid the work pieces burning, or wheel jumpimg Don`t use heavy and strong grinding pressure. It can lead to the spindle curve and the breakage of the wheels. The importance of proper machine maintenance and safety guidelines.